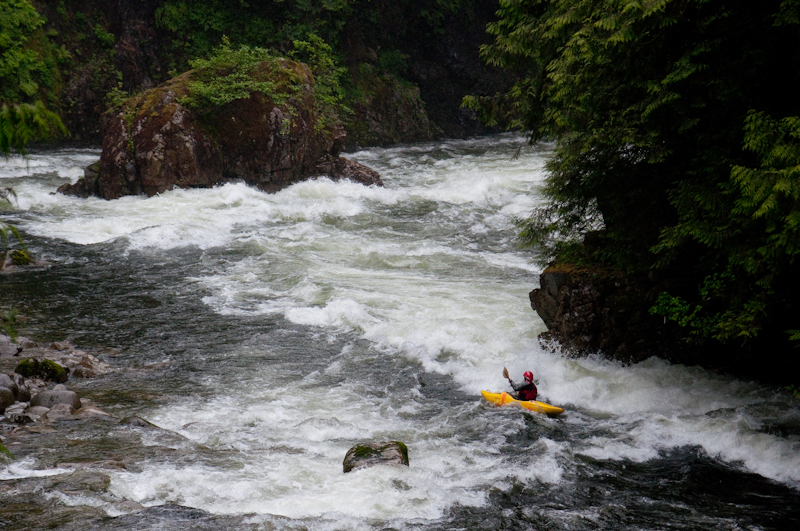 What It's Like: A short run in North Vancouver flowing through a scenic canyon with easy whitewater. Scouting/Portaging: Scouting is easy. It's unlikely you'll need to portage anything unless the river is flooding. When To Go: After heavy rain. Runs at low water during snowmelt. Map: Click here for a detailed map of the river zone. 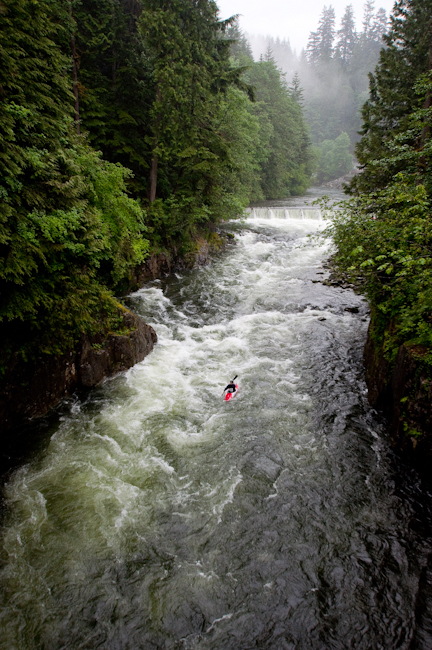 The Capilano is another member of the North Vancouver trifecta of whitewater rivers along with the Seymour and the Lynn. Although the Capilano is the easiest run on the North Shore, it too flows through a beautiful, lush rainforest canyon with easy access and a quick shuttle. The Capilano is of interest to intermediate boaters at low water when it offers a pleasant paddle through mellow canyons and over gravel bars. At very high flows the run turns into a fun blast down big water class III with roiling boils, fun eddies and squirrely seams. Medium levels bring something in between. The Cap has a convenient stick gauge at the put in that has a permanent web cam aimed at it that is available online courtesy of the Vancouver Whitewater Club. We recommend 3 as a minimum level, though lower is possible. Many intermediate boaters start to shy away at 5-6 due to the boily nature of the narrow canyons and headwalls near the start. The run starts to get a big water feel once the level goes off the gauge (~8). Metro Vancouver water resources recently made available an online gauge for the Cap, measured in cms. 30-40 cms is ~3 on the stick, 150 is ~8 on the stick and 200 cms is at the top of the concrete weir the gauge is bolted to (est. 10). The upper limit on the Cap is hard to find. It's of interest to class V boaters at as high as possible when the Seymour and Lynn are blown out; despite the low gradient it is a very fun paddle, especially if you catch all the boiling eddies. At extreme, biblical flood levels (300+ cms) a dangerous compression hole with an unbeliveably large recirculation (the 'death hole') forms in the first 500 m of the run - the Cap rarely gets high enough for this to happen, but it's worth being aware of if you are paddling the run during an extreme high water event. Please scout well - the Cap is no joke at 300+ cms. Access to the Capilano is along paved city streets. The put in is at the Capilano Fish Hatchery north of highway 1 off of Capilano Road. This area is a park with ample parking and many trails along the river. Hop the fence and put in below the weir at the hatchery itself. There are multiple take out options for the Capilano, depending on how far you want to paddle downstream, and how much road congestion you want to drive through. We recommend parking behind the Evergreen Squash Club located off Curling Road. Curling Road is north of Marine Drive - turn in at the Shell station. The parking lot is around the back - drive slowly. Make sure to walk to the river to check were you will need to stop paddling. If this parking doesn't work for you, just pick any other location with public access to the water with parking nearby. There is not much to say about the kayaking itself. The run starts off with rapids that run through some small canyons, with headwalls and boils being the main challenge. About half way down the walls fall back and the majority of the rapids are formed by gravel bars. The death hole is at a left bend with a narrow constriction. It's possible to eddy out above to walk it. Any other objective hazards should be easy to see from well upstream. Looking up towards the put in of the Capilano. Paddling in to House Rock rapid. This is the biggest rapid.